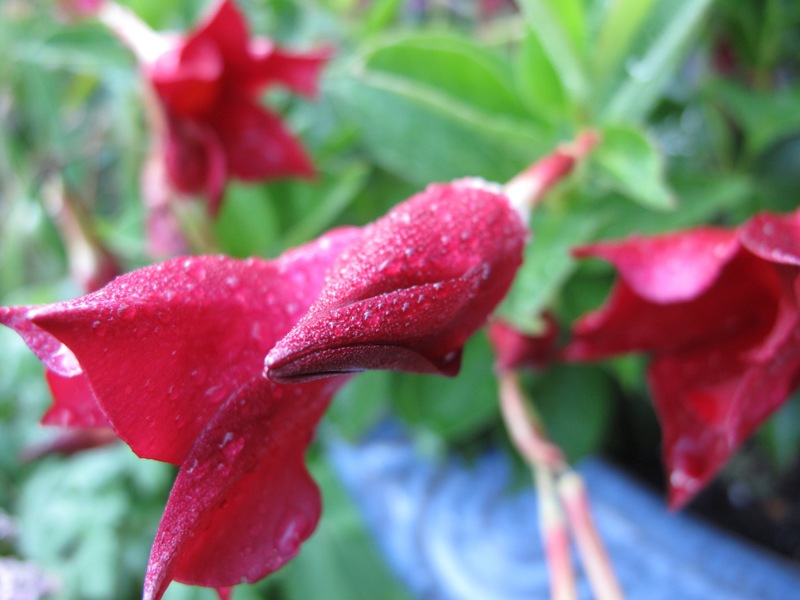 This entry was posted in garden and tagged annuals, Dipladenia ‘Madinia Deep Red’, wordless wednesday on July 6, 2016 by pbmgarden. Yes, it is a tropical from South America. Not winter hardy here. I’ve never grown it before but saw it last week at a garden center and decided to try it. 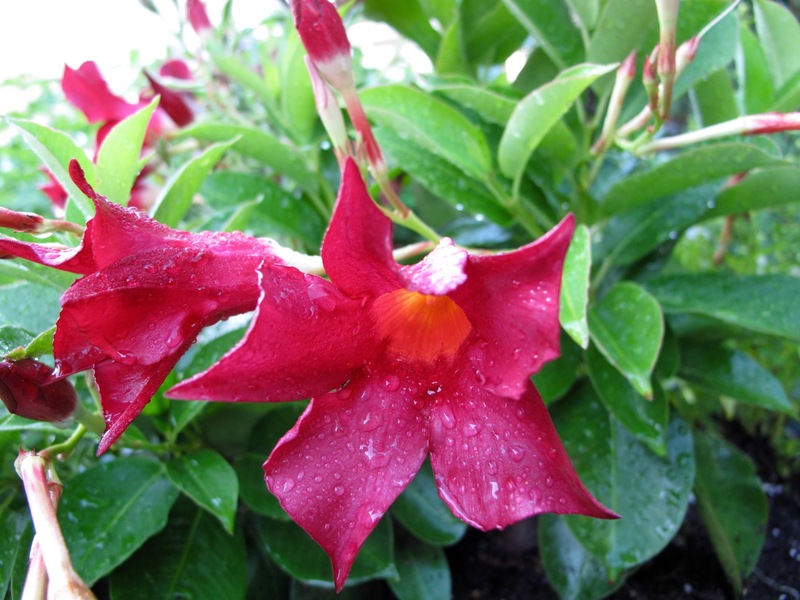 Similar to mandevilla but more upright form instead of vining. Red is always a winner for hot summer days. Wow, that’s a beauty! And great for a wordless Wednesday! Thanks Beth. Hope this plant likes hot and humid weather as described, because we’re surely getting steamy days here since July. 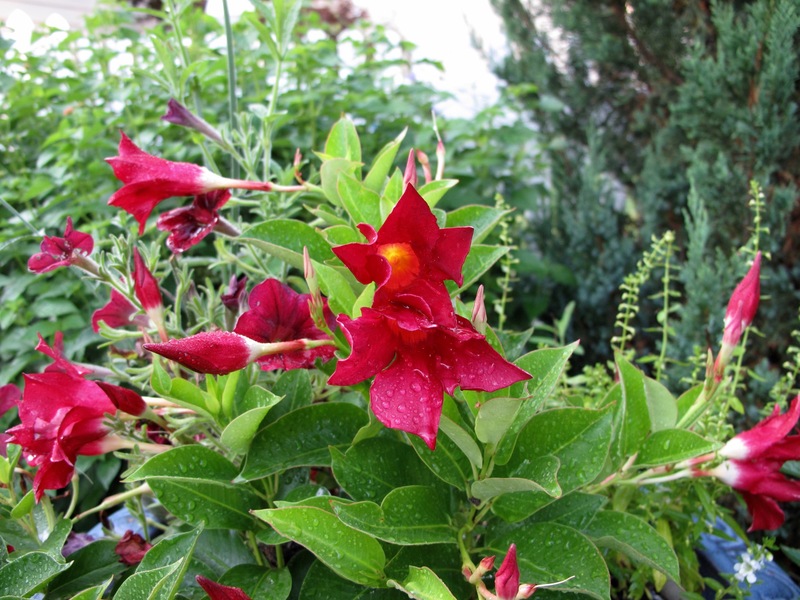 Similar to mandevilla but more upright form instead of vining. Very pretty! Are they vase hardy? Hi Kris, I’ve not grown this before but saw it at the garden center last week and since I needed something to fill a large pot outdoors I decided to try it. It might be interesting in a vase–will have to test. Mine is zone 7b so this plant will have to just be a summer annual. Apparently it can do well indoors too. Pretty! Did you get rain? Nothing here, dagnabbit! Hope the rain finds you. Can’t complain here. We’re getting some almost every day for which I am grateful. But since July it’s been noticeably hotter and humidity is ridiculous–think sauna. Those trumpets could give Satchmo a run for his money. We love Louis at this house–my husband especially. I have high hopes for this container plant so hope it’s a great performer. Beautiful. A real fanfare! I have had one in a pot in past years. Love this colour. Thanks Cathy. Hope it blooms well all summer. I started a red border a few years ago but it’s actually full of reds and things that clash with reds! Gorgeous colour. And the droplets. Yes, isn’t it a good red! We’ve had a lot of rain. Droplets always add some character or glamour don’t they. I also discovered this variety this year – beautiful and lasting! Glad to hear you’re enjoying this plant too Elizabeth. We’re heading into some serious heat for the next few days (100F tomorrow) so hope this one has had time to get established. The best trumpets are red ones! Definitely into red this year.